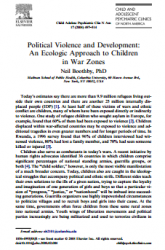 This journal article, published in Child and Adolescent Psychiatric Clinics of North America, outlines necessary intervention strategies for children affected by war. An ecological approach is recommended to address children's issues as a part of a community. Children should have access to psychosocial programming, including safe spaces. The report describes various programmatic methods and makes recommendations for further actions.